The DA's Gauteng premier candidate, Solly Msimanga, laid a complaint at the Alexandra police station on Sunday. However, the ANC in the provinces labelled it as a "cheap political stunt". The DA in Gauteng claims that the Alexandra protests have been orchestrated by the governing party to influence the upcoming elections. Msimanga said he has evidence that the actions that took place in Alexandra township last week was not a service delivery protest but rather criminal chaos, which he said is being carefully coordinated by the ANC and its affiliates. "The Democratic Alliance (DA) has seen WhatsApp messages from a South African National Civic Organisation (SANCO) group, where activities aimed against Johannesburg Mayor Herman Mashaba were coordinated," Msimanga said. "Furthermore, we have seen a WhatsApp exchange where one of the organisers infers that their actions are being supported by the ANC. Further digging on social media revealed that the organisers were wearing ANC regalia." "From the get-go, social media mobilisation regarding the Alex protests was driven by ANC members, most prominently by the Criminal Syndicate’s Head of Campaigns, Fikile Mbalula," he claimed. In addition to laying charges, Msimanga said that they would also be approaching the Electoral Commission of SA (IEC), believing that the ANC breached the Electoral Code of Conduct. "Isn't there a contravention of the electoral code of conduct where people are actually inciting violence where people are using intimidating tactics in order to influence the elections come 8 May." The former Tshwane Mayor also said that they would be approaching the national and provincial police commissioners, to ensure that the matter is investigated and to make sure that the alleged orchestrated manufactured violence does not spread. "We are also going to say to the police commissioner that this must not only be left in Alexandra. Its already alleged that this is going to be coordinated in other areas." 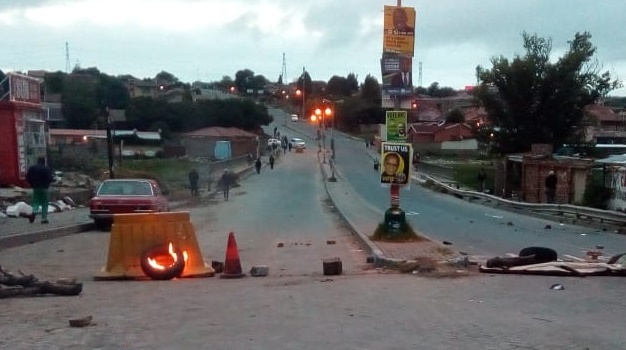 The ANC hit back in a statement on Sunday, saying that instead of meeting with residents of Alexandra, as requested, the party had opted to rather open a case. "Realising that the DA’s campaign is floundering in Gauteng since the party deployed another failed former mayor of Tshwane to be its premier candidate, the DA is now desperate to find relevance," states ANC Gauteng Deputy Provincial Chairperson Comrade Panyaza Lesufi. The party said the the DA must not hide behind the ANC and use it as an excuse for its dismal failure to respond to the plight of the those living in Alexandra since taking over the City of Joburg.